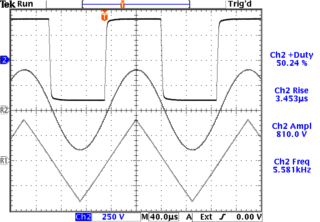 These models provide sine, square, triangular waveforms, with variable DC offsets. They may also be used as variable gain amplifiers. Gain and amplitude parameters can often be customized for special applications. These models include an internal function generator circuit and computer-control (GPIB, RS-232, optional Ethernet) interfaces. "Stripped-down" versions of these instruments omitting these features but providing the same output circuitry are available in our line of high-voltage amplifiers.